Christine has been with Rock Steady since 2007. Her husband, Tom, was diagnosed with Parkinson’s in 2000. Exercise has always been a constant in both Tom and Christine’s lives. Christine has been Tom’s carepartner and understands all too well the needs of people struggling with Parkinson’s. Having trained hundreds of people with Parkinson’s as well as being immersed as a carepartner has given Christine a unique intimate perspective on how to battle this disease. In addition to being a phenomenal athlete (and boxer! ), Christine is an experienced lifeguard, swimming and aerobics instructor. 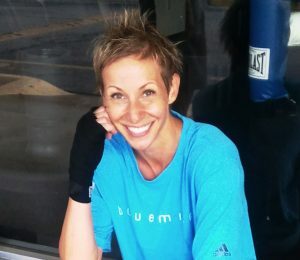 She is a Certified Personal Trainer through the American College of Sports Medicine and her personal experience is an instrumental part of Rock Steady’s “Cornerman” support. A third generation artist (Degree in Fine Arts – Herron School of Art and Design) and jewelry designer by trade, Christine has made many custom-designed Rock Steady jewelry pieces which are worn proudly by friends and family of the gym.